NOTE: Free shipping on preamps in the US! You will have an option to choose free shipping on checkout if this is the only item in your cart. However, if there are any other items in your cart at the time, the free shipping option will be removed. Please email Will@sadowsky.com with any questions. Our famous preamp pedal, in a smaller footprint! At NAMM 2017, we released a new version of our popular preamp pedal. The new SBP-2 has the same famous circuit that goes in all Sadowsky basses—just like the original Sadowsky Preamp/DI pedal—but with a slimmed down design and smaller footprint that is perfect for crammed pedalboards and vintage basses where onboard preamp installation would affect resale value. It works with all passive basses, active pickups, and upright bass pickups. 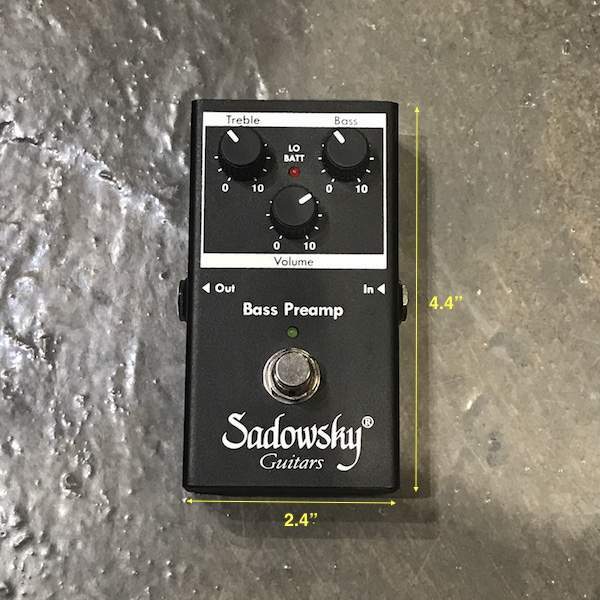 The original Sadowsky Bass Preamp/DI Pedal as well as our onboard preamps are still available here. See the manual for more info. NOTE: if you want to order more than one preamp, please contact our shipping manager: (718) 433-1990 /will@sadowsky.com.